Description: I believe the presentation of this 100% Colt Ace is one of a kind. I have searched the Internet image history and find no presentation box like it. Colt's letter states this Ace was mailed to Providence, R.I. on August 22, 1938, as a shipment of ONE to Belcher & Loomis Hardware Company, Providence, R.I. The ivory stocks are not listed in Colt records. Nor is the presentation case. You can see that the ivory stocks are original as they carry the Colt stallion. 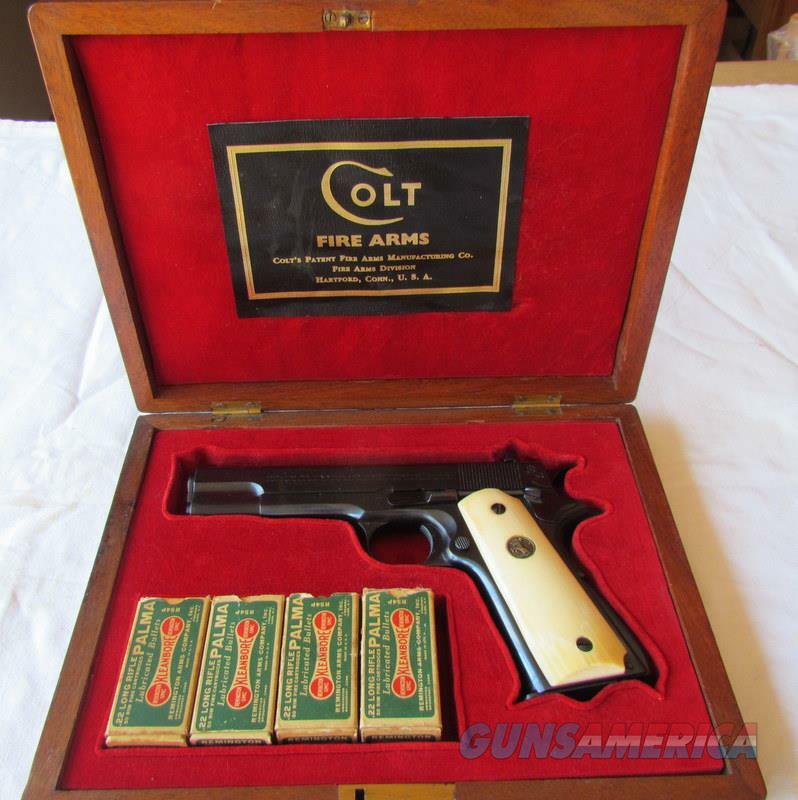 The Oak presentation case carries the Colt Mfg. Co. logo. The 4 boxes of Kleenbore .22 cal. ammo appear about as old as 1938 and original to the box. All 4 boxes are full. Looking closely at the pistol it looks like it has been fired. The bluing and everything about the Ace, including the barrel and stocks, appear 100%. My research suggests to me that this may have been a presentation to an executive of Belcher et al from Samuel P. Colt, the son of Samuel Colt of Colt firearms. From newspaper articles and advertising of the period, the rubber trade and products business in Rhode Island was a big deal during the early 1900's. According to articles of the 20s, Belcher & Lommis took over Kelly-Springfield Tire Co. in 1921. Samuel P. Colt was the president and general mgr of Woonsocket Rubber, then Providence Rubber then U.S. Rubber, the largest in the U.S. Articles of that period link Colt with the Belcher company in a cooperative manner. Finding an article showing the presentation of this pistol would have been great but no such luck. This pistol is pre- WWII and thereby qualifies as a C&R firearm. If interested, I have more photos. PAYMENT OPTIONS- For immediate shipment I only accept USPS money orders. I accept other methods of payment, personal check, Bank MO, etc, but will not ship until payment clears my bank. I will also accept certain Paypal payments prearranged with me. LAYAWAY: If needed I offer a 60 lay-a-way option. It is 1/3 immediately, 1/3 in 30 days and 1/3 in 60 days. Lay-a-way Firearm sales are final. If you fail to close the deal I will hold funds until the firearm is sold. If the firearm is sold for less, the difference will be deducted from the deposit plus 10% for my time, storage and taking the firearm off the market for your lay-a-way period. SHIPPING: All firearms shipped Priority Mail with insurance. Price stated is for the lower 48. LEGAL REQUIREMENT- Modern firearms must be transferred through a licensed FFL dealer in Buyer's area. Buyer must supply to Seller a copy of Buyer's driver license and a copy of Buyer's local FFL dealer's license before shipment will be made. A C&R License is acceptable for C&R firearms. All handguns are shipped to an FFL. SAFETY NOTICE- Buyer is solely responsible for determining that the firearm purchased is safe to shoot. By bidding, the buyer agrees to hold seller harmless against damages, injury, or death caused by buyer's failure to have the firearm properly inspected for safety. RETURN POLICY- All firearms come with a 3-day return policy conditioned upon the firearm being returned in exactly the condition mailed- not being fired , messed with in any way. In the case of a return, buyer pays all shipping charges. FIREARM MUST REMAIN WITH THE FFL DURING THE INSPECTION PERIOD. IF FIRED, SALE IS FINAL. YOU HAVE A 3 DAY INSPECTION PERIOD FROM THE DATE OF DELIVERY TO FFL OR C&R DEALER. IF YOU DECIDE TO RETURN THE ITEM, WE WILL NOT REFUND SHIPPING COSTS AND THERE IS A 10% RESTOCKING FEE DEDUCTED FROM REFUND. YOUR BID IS A BINDING CONTRACT, AND THIS CONTRACT INCLUDES YOU AGREEING TO ALL OF THE ABOVE, THE RESTOCKING FEE AND NO REFUNDS FOR SHIPPING. My FFL license is that of a C&R license.